This meaty herb and tomato sauce is perfect on homemade gnocchi. Recipe courtesy of Annie Buttus of That Little Place By The Lights. 1. Place a pot on medium to low heat and add oil and butter. 2. Add onions and sauté until they are golden brown. 3. Add ground beef and cook until brown. 4. Add all the spices. 5. Add tomato sauce, diced tomatoes and tomato paste. 6. Rinse tomato jars or cans by filling them half way with water and adding the remnants to the sauce. 7. Let sauce cook for 1 ½ hours over medium heat. 1. Boil unpeeled potatoes in pot until they are easy to pierce with a fork. 2. Drain potatoes and let them cool. Once cool peel and mash. 3. Dust a clean work surface with flour. 4. Place mashed potatoes on work surface. 5. Create an indentation in the centre of mashed potatoes and fill with eggs and salt. 6. Knead dough, adding flour as needed until firm. 7. Divide dough into 4 equal pieces, dust work surface lightly with flour. By hand, roll dough into large rope sized pieces. 8. With a sharp knife, cut dough into ½-inch long pieces. Continue until all dough is cut. 9. Transfer gnocchi to a plate dusted with flour. 10. Fill large pot with water and salt. When water boils use a flat bench scraper to scoop up gnocchi and drop in boiling water. 11. When the gnocchi rises to the surface they are ready. Scoop gnocchi out and transfer to a colander. 12. 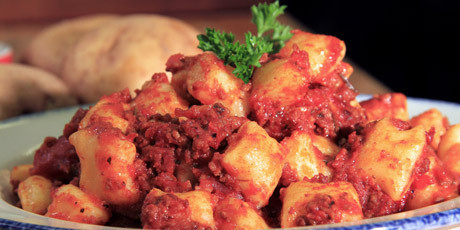 Toss gnocchi in Annie’s Meat Sauce and serve.